Thistle Dew! is all about our Customers and our most valuable assets: Our Associates. Our core group of associates are dedicated, experienced and focused on satisfying the Customer. In today's fast paced retailing environment, Thistle Dew! offers Premium Loose Leaf Teas, Spices, Herbs and merchandising solutions to our Clients by providing them with quality decorating solutions. Thistle Dew's! seasoned team of designers & merchants are all focused on providing excellent quality products for the Customers that are current trend conscious, value priced as well as environmentally sustainable. We are all about the Home and how to provide trend focused and affordable solutions to the Home maker on a budget. Thistle Dew! is currently located in Pennsylvania and will remain located in the United States. Although we provide a global solution with unsurpassed experience in manufacturing and product design, all with unbridled passion, building on strategic alliances to bring new & innovative products to market and to our Valued Customers. *It was a stormy afternoon that September day in 2005, that changed my life forever. We were returning to dock in the boat that we had lived on for 10 years. As I was fending the boat away, a gust of wind and my right foot slipped between the wet dock and was crushed between the heavy 32' cabin cruiser and the wooden dock. 7 surgeries later, 3 years in a halo cast, bone infections, complete with staph infections and I.V. 's, bone marrow in the blood stream and blood clots in my leg. The Doctors informed me that there was a lack of blood circulation, muscle deterioration, bone fragments and extensive nerve damage and they wanted to amputate, 10" below the knee. To merely survive, I had already sold all of my belongings on e-bay, and yard sales, cashed in my 401K, IRA and bonds, ran up credit cards, extinguished savings and disability insurance, and was laughed at by our government and SSI, one which I had paid into for many years. *Depression had taken over my once outgoing bubbly personality and self esteem. My team of Doctors had me living on drugs, anti-depressants, anti-anxiety, sleeping pills, blood thinners, nerve blockers, muscle relaxers and pain relievers, a grand total of 38 different medications. The morning that I had received the news that they were going to amputate, I had literally reached the end of my rope. I was sitting on my porch sipping on a steamy cup of tea, as tears of defeat streamed down my face. My porch overlooked my once beautiful, now very overgrown garden. Out of this brush, I noticed beside my burn barrel, there stood a beautiful purple thistle, glistening in the morning dew. The ground was hard from years of neglect and the weeds attempted to strangle its very life. But this determined thistle fought on. It was then that I realized that even though life was crumbling around it, here it was in all its glory, standing proud. And it was at that very moment, Thistle Dew! was born. I, like this determined plant, was fighting to survive. This straggly weed which managed to bloom into this beautiful purple flower. Its fluffy seed pods floating along the breeze, spreading itself out and growing. Bringing beauty to the area, little patches at a time. Just like that thistle, Thistle Dew! and I, are determined to survive, standing strong, spreading out and growing. The surgery was canceled and physical therapy began. A nerve blocking chip was placed in my spine and walking began. From wheelchair to crutches to walker then canes. *10 months into physical therapy my insurance ran out. So, I took it upon myself to start walking around the local area. Which just happened to be a State Park. With cane, wagon and dog in hand, I would stroll the woodlands gathering flowers and stuffing them into milk crates strapped to my wagon. Violet, my English Bulldog and I would take turns resting on the wagon. I would take the flowers and leaves home and dry or press them. 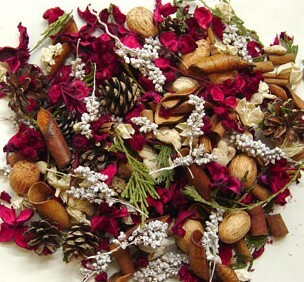 The first Potpourri, Wilderness Trail, was made. To get money to purchase sachet material, I would pull my wagon around the college neighborhood and pick up bottles and cans and cash them in as deposits or recycling. After a summer of doing this, I had enough inventory to do my first craft show on October 24th 2009. And I would like to thank each and every person who has help support me along the way. Maintain and promote our wares on Facebook and of course our main Website, here. 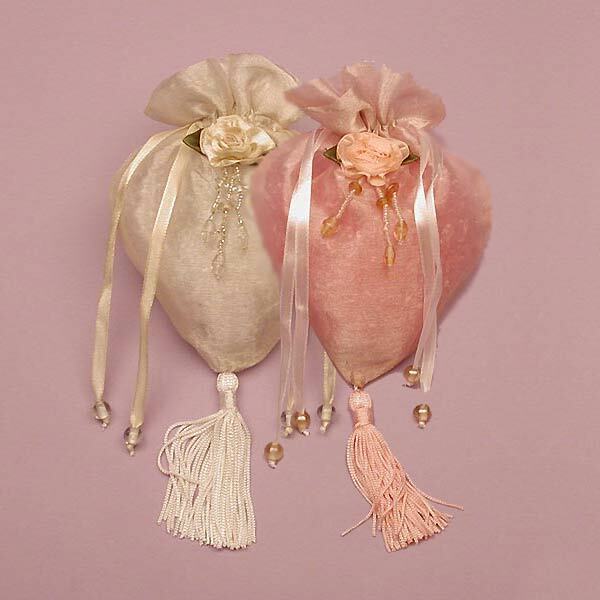 Offer a full line of wholesale products for our clients: Wine Bags for liquor stores, Velvet bags for Jewelers, etc. Fund-raisers for Schools, Churches, fire companies and other small organizations. 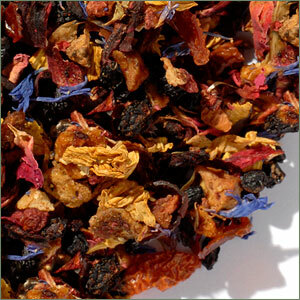 At Thistle Dew, We sell Premium Loose Leaf Teas and only the finest Potpourri, made from premium botanical ingredients. The Potpourri components are carefully selected and blended, dyed (if applicable) to merely enhance their beauty, and scented by hand. Some of the flowers are grown on the premises. The Sachet materials are hand selected form local fabric stores and hand sewn. They are chosen to color match and enhance, but not hide, the beautiful Potpourri. Some of the current sachets.